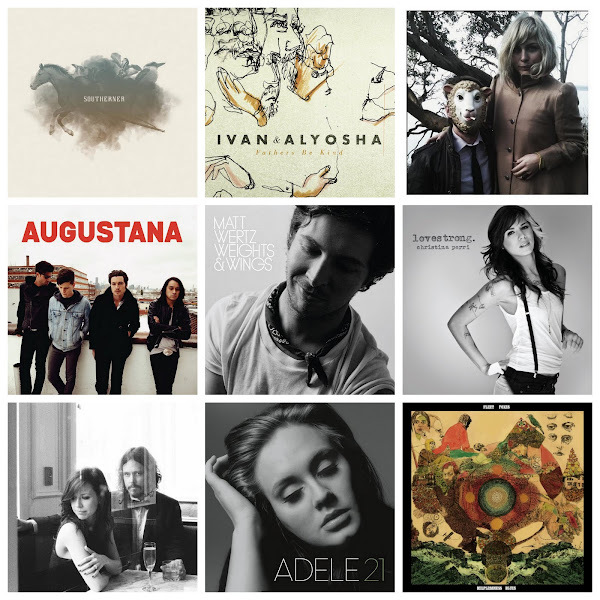 We're not even in June yet, and already my list of favorite 2011 albums is pretty stacked. I've got nine albums on my list. Come December I'm gonna have to be really discriminating in order to pick just 10. Southerner - Trent Dabbs . I come back to this album all the time. Every song is terrific, and Dabbs has set the bar high for "best of" lists. Fave tracks: 'Leave To See ', 'Catch Me Up To Speed ', and 'Me & God '. Fathers Be Kind EP - Ivan & Alyosha. I recently texted my brother that this band is hands down my favorite discovery of 2011. I have every song they've released and I love every single one. Please, go give them a listen. Fave tracks: 'I Was Born To Love Her ', 'Everything is Burning ' [maybe the prettiest song ever, also track 3 on the May mix], and 'Fathers Be Kind '. This NPR tiny desk concert is still one of my favorite videos too. Augustana - Augustana . On occasion, my brother Mitch and I agree on great music. Band of Horses, Coldplay, and Augustana. This newest release is, in my opinion, their very best. Every track is excellent and I listened to this album over and over while driving to and from Utah. Brandon and I both think it has a very 80's U2 feel. I may join Mitch to see them live in June. [can I come with you Mitch?] Fave tracks: 'On The Other Side ', 'Counting Stars ', and 'Just Stay Here Tonight '. Weights & Wings - Matt Wertz . When Matt sings love songs, he creates magic. Like on the song 'Easier Tonight .' That's my favorite track. But he's also great at making you want to move, like on the song 'Everything Will Be Alright . Lovestrong - Christina Perri . Ever since I heard her voice on SYTYCD, and saw her perform her hit 'Jar of Hearts ', I've been a fan. Now she's released a full length album and it's full of more great songs with beautiful melodies and heart wrenching lyrics. Fave tracks: 'Arms ', 'Penguin ' and 'Bang Bang Bang '. Barton Hollow - The Civil Wars . I've got two exciting concerts on the horizon. This is one of them. I'll be seeing this amazing duo at my favorite venue, The Triple Door in Seattle, and I CAN'T WAIT! This album has taken the music scene by a storm and for good reason. It's a gorgeous album laced with haunting melodies and beautiful harmonies. Fave tracks: honestly, I can't pick one because they are all so amazing! 21 - Adele . This is the other exciting concert I'm going to. Me and my mom will head to Portland on June 3rd to witness her awesomeness LIVE. The concert sold out in minutes so I'm feeling super lucky to have tickets. This album is just stellar from track one to the last note. Fave tracks: 'Someone Like You ', 'Rolling In The Deep ' and 'Turning Tables '. Helplessness Blues - Fleet Foxes . I had tickets to see the Fleet Foxes on the 3rd, but sadly had to sell them because my mommy duties take priority. Lily had a play that night, and although I would never have missed her play the leading female role, I wondered all night how the show was going. I asked the person who bought the tickets to please, kindly report back about how the show was, and here is what she said "The three-way harmonies were even more striking in person than on the albums. You can just feel the talent oozing from every member of Fleet Foxes." That's what I had hoped to experience, so they are still on my list of 'must see' shows. This album will have to suffice in the meantime, which isn't too shabby. The Fleet Foxes brand of shared vocals and roaming guitar is something special. Fave tracks: 'The Cascades ' [instrumental gorgeousness], 'Helplessness Blues ', 'Montezuma ', and 'Blue Spotted Tail '. Hope you find a favorite here too!